Let us engrave this for you to create a memorable keepsake for a bride and groom to be, for their wedding and celebrations to come! Specify “Store Pickup” on check out and shipping charges will not apply. Pick up during store hours (specify Tioga or Ocala in “Comments”). Let us engrave this for you! 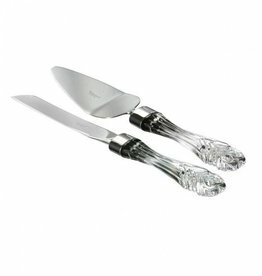 Lismore offset cake/pie server comes from the classic Lismore collection, a favorite for years. Beautiful serving piece is a must for your special reception. Crystal keepsake will be treasured for anniversaries to come. This is a wonderful piece to have engraved for a perfect wedding gift! 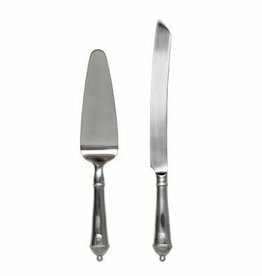 The Martello pastry server is forged by Italian artisans that add hammered detail to the handle. A great piece to serve your desserts and one of our most popular flatware patterns. Engrave for a perfect wedding gift! Created by hand sand casting from recycled aluminum. Hand wash with mild detergent to retain no-polish finish. The Aladdin Antique Pastry Server in ivory features elegant pearlized handles, with the strength of high-grade acrylic and 18/10 stainless steel. From our Berry & Thread Collection - our cake-serving duo is ready to celebrate! From a once-in-a-lifetime wedding cake to annual holiday pies this set will quickly become a family heirloom. From our Berry & Thread Collection - Our cake serving duo is ready to celebrate! From a once-in-a-lifetime wedding cake to annual holiday pies this set will quickly become a family heirloom. Stainless steel. Includes cake knife and dessert server.